Appendix "A" U.S.S. TICONDEROGA (CV14) Photos Nos. 941-45 to 948-45 Incl., 950-45 to 952-45 Incl., 955-45, 958-45 & 959-45, and Puget Sound Navy Yard Photographs Nos. 900-45 to 923-45 Incl., 925-45 to 940-45 incl. Appendix "C" Puget Sound Navy Yard Sketch of Fire Damaged Areas Affecting Electrical Equipment. Ref: (a) C.O. CV14 1tr. CV14/L11-1 serial 023 of 27 January, 1945. This is the ship's report on the attack. (b)	BuShips ltr. CV9 Class/L9-3(5812), NObs-81 of 30 April 1945. (c) BuShips ltr. C-CV9 Class/S38-1(638-812-512) of 11 March 1945. (d)	BuShips ltr. S38-1-(2)(447-688-638) EN28/A2-11 of 17 August 1944. (e) PSNY conf. Spdltr, CV9-S61(283) serial 010 of 17 April 1945. 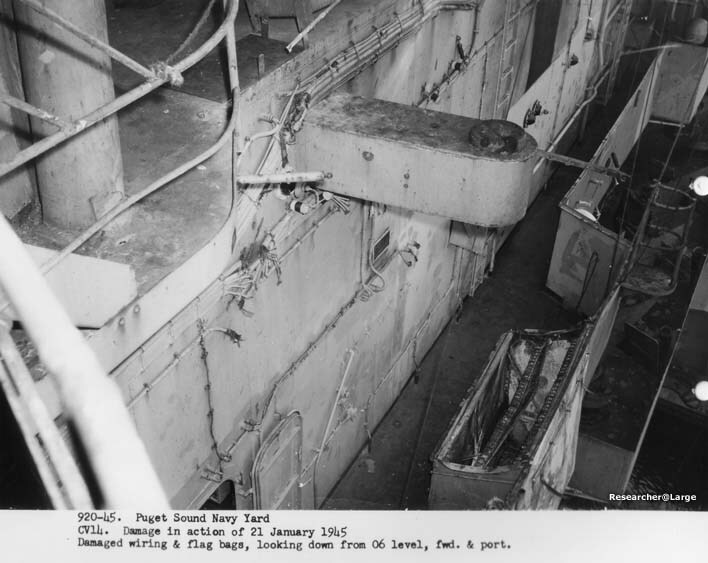 (f) Puget Sound Navy Yard War Damage Report U.S.S. FRANKLIN (CV13) Action of 30 October 1944. (g) PSNY Spdltr (SL) CV9 Class/S1l-6(223)(274)(27l) Serial 1582 of 13 June 1945. (h)BuShips Plan Basic No. 609942 - "Second Deck - Compt. and Access. (CV33)." 1. While operating in waters several hundred miles east of Formosa on 21 January 1945 the U.S.S. TICONDEROGA was struck by two Japanese planes. The first plane hit the Flight Deck at about 1210 at approximately frame 69 twelve feet to port of centerline. The plane carried a bomb, estimated to be 250 KG SAP, which exploded between the Hangar Deck and Gallery Deck. The second plane came in from starboard at about 1258 and crashed into the forward 5 inch director at frame 90 on the Island Structure. It is believed that this plane carried two 250 KG SAP bombs which exploded one on each side of the director. The condition of the ship at the time of the attack and the measures taken to maintain military efficiency and seaworthiness are described in the ship's report, reference (a). The damage due to the explosions and fire, as determined by the Yard from an inspection of the vessel and from discussion with ship's personnel, is described in this report. 1. A general description of the principal structural damage sustained by the ship is well covered in the ship's report, and will not be elaborated upon in this report, except as commented upon in the following paragraphs. 2. 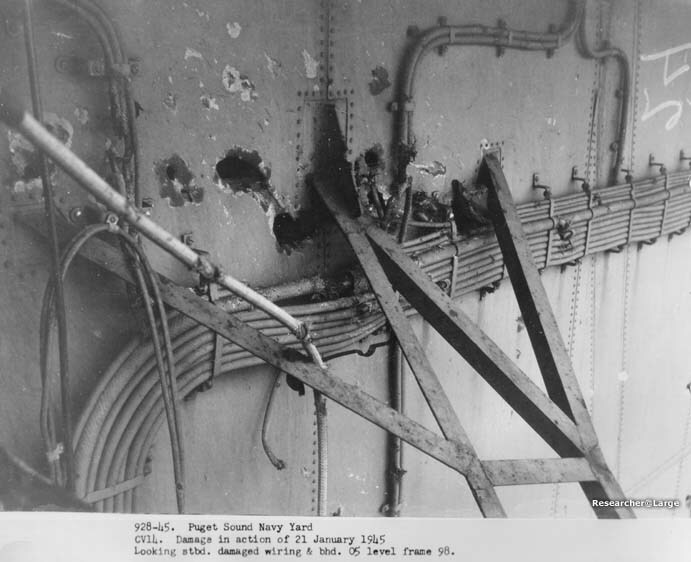 Damage to the ship's structure from hit No. 1 consisted of large holes torn in Gallery Deck bulkheads Nos. 67 and 70, which are primarily Flight Deck supporting girders (see Photos. 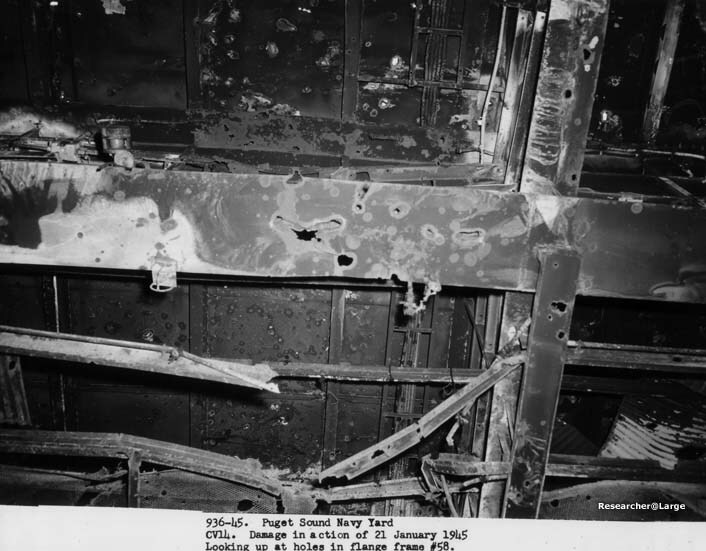 Nos 917-45, 948-45, and 949-45), and of blast and fragment damage to the girder at frame 63 (see Photos. Nos. 932-45 and 935-45). The girders as frames 67 and 70 were materially weakened near midspan and yet showed no evidence of failure. 3. Fragment holes in the stack casing and other structure indicates that damage in the vicinity of hit No. 2 resulted from both the impact of the plane on the 5" director foundatio	n and the explosion of two bombs carried by the plane, on each side of the island at the Air Defense Level. There was no significant structural damage from hit No. 2 other than weld failure in the S.T.S. shields and director foundation due to poor workmanship (See Photo No. 907-45). 1. Damage to hull fittings from the hit on the island structure was minor. The signal yardarm was enveloped in flames which destroyed equipment mounted on it. The signal halyards, which were consumed by flames, spread the fire to flag bags. The 20mm R.S. locker for gun No. 32 (top of pilot house at frame 101 port) was punctured by fragments, but the ammunition did not detonate. One cartridge holder for 40mm ammunition in the bulwark R.S. stowage for quad. mount at frame 85 on the forward Air Defense Level was exploded. The canvas cover for this ammunition burned, but no other explosion occured. Fragment damage to three 12-inch signal searchlights put them out of action. 2. 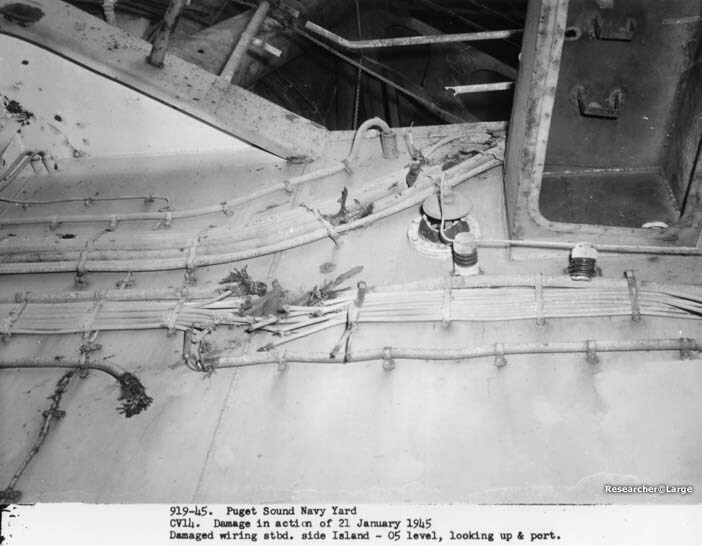 The hit on the Flight Deck caused more extensive damage to hull fittings than the hit on the lsland Structure. At the time of the hit, No. 1 airplane elevator was loaded with one plane and starting up from the Hangar Deck; the bomb explosion on the Hangar Deck set fire to the plane which temporarily put the elevator out of action. The elevator platform showed evidence of intense heat as the wood decking was charred to a depth varying from one-quarter to one-half inch, but no appreciable distortion of the platform was apparent. 3. Fragments from the bomb which exploded at the Hangar Deck, or from the secondary explosion of the burning plane on the elevator platform, struck the starboard catapult leads at a height of about three to five feet above the Hangar Deck piercing the cable tubes and partially severing the two inboard starboard cables. The starboard catapult was not used after the hit due to damage to the cables and flooding of the pump room (A405AE) by water from the Hangar Deck which came through the hatch in the elevator well at about frame 32. However, the port catapult remained operative. 4. The forward starboard boat and airplane crane was struck by the bomb nose fuse which pierced the chord of the jib at a point about ten feet from the center of rotation of the crane. The operation of the crane was not impared (as regards machinery) although it was not used for heavy loads until repaired. 5. 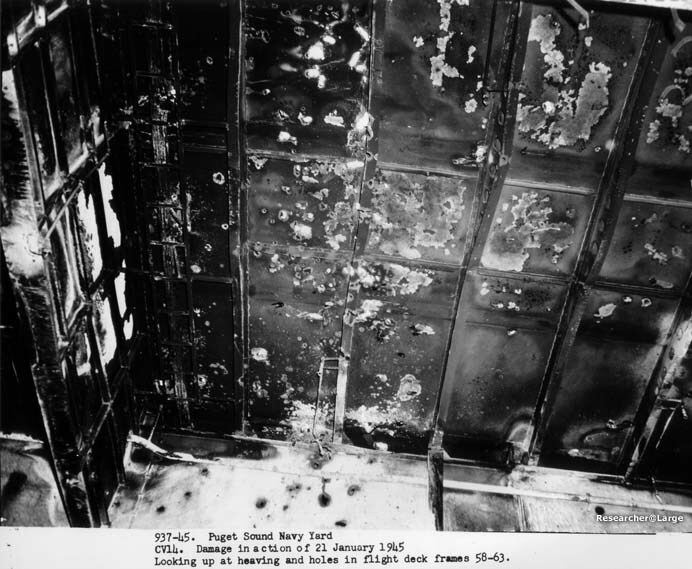 Two bomb elevators adjacent to the explosion area at the Hangar Deck were damaged by fragments and fire. The elevator trunk at frame 58 starboard (A-417T) was pierced by fragments above the Hangar Deck and the inboard side was caved in. 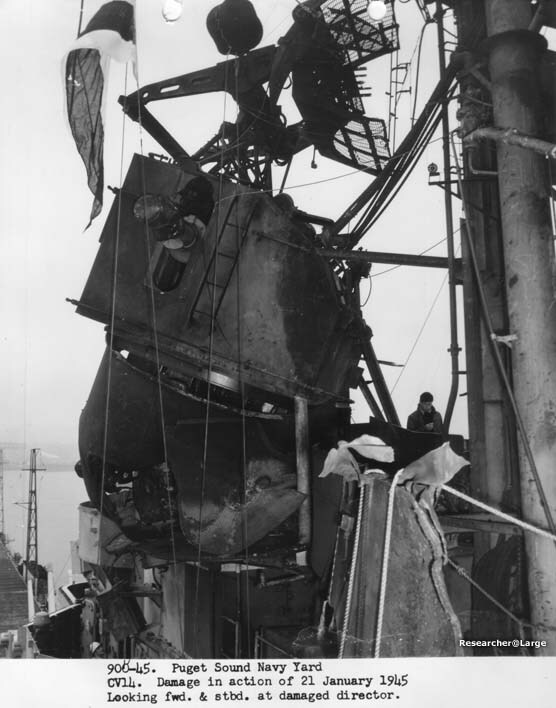 The elevator platform lodged near the Forecastle Deck level and was later shored in this position since the electrical leads and controls were destroyed by fire and the guide rails were out of line due to distortion of the trunk. The elevator trunk at frame 79 starboard (B-403T) received two large holes in the forward side above the Hangar Deck and a large dent in the after side, and the flame seal door was damaged by smaller fragments. No spread of the fire via the trunks occurred. 7. 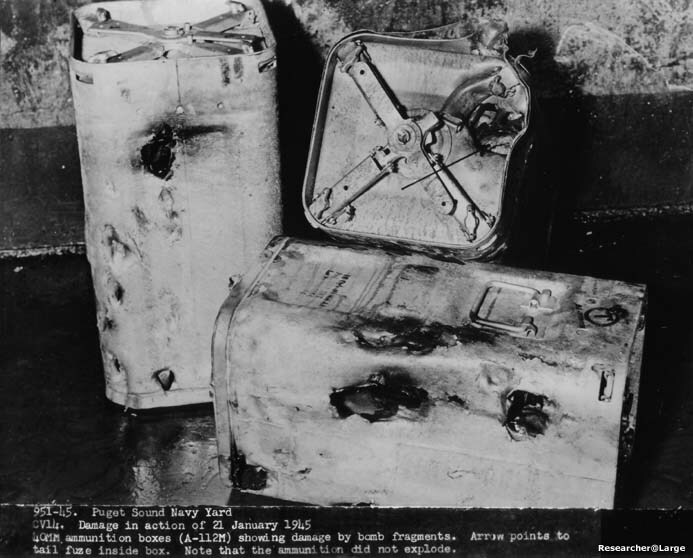 The droppable gasoline tank stowage for a aircraft at the Gallery Deck level from frames 44 to 58 was destroyed by a combination of the fire at the Hangar Deck, the impact of the plane, and fragments from the bomb explosion. The close spacing of this stowage seriously hampered the effectiveness of sprinkling system since the tanks were below the sprinklers. This caused water to come down in streams rather than in a spray. 8. Other items damaged by the fire on the Hangar Deck include arresting gear units 1A, 2A and 3A which were exposed to great heat. The chain hoist under the Flight Deck at frame 65 starboard was damaged so badly by fire that replacement was required. See Photo. No. 935-45. All other damage to hull fitting items in this area (Hangar Deck and above, frames 45 to 85) was minor. 9. Hull fitting items of major importance to the fighting efficiency of the ship, for the most part, escaped permanent crippling damage. Some units, such as the starboard catapult and No. 1 bomb elevator, were rendered inoperative, but alternate units were available. The efficiency of the ship was reduced in some degree but the damage was, in general, the natural effect of fire and explosion and no loss of function of important equipment was due to poor design features. 10. The closely spaced droppable gasoline tank stowage is necessary due to the large number stowed and the space available for stowing. This type of overhead stowage includes a light weight platform which blanks off the Hangar Space below from sprinkling. To correct this unsatisfactory condition, the Yard installled additional sprinkler systems under the stowage platform similar to those recently installed on CV13 and CV17. It is recommended that all similar type tank stowage now in use be investigagted and if conditions warrant, action be taken to insure adequate sprinkling below the stowage platforms. 1. This vessel and others of the class have experienced difficulty in fighting fires in the Second Deck area due to the presence of smoke and gases. The recent battle experience of the BUNKER HILL shows the need for better fume tight subdivision on the Second Deck between frames 79 and 131 so that smoke and gases may be contained to the compartments in which the fire exists. 2. In reference (g) the Yard recommended replacement of arches and metal joiner doors with quick acting or structural doors between bulkheads 79 and 131 on the Second Deck. It is noted from reference (h) that the later CV9 class vessels are so compartmentalized. 1. The piping damage sustained by the TICONDEROGA (CV14) was similar to the described in reference (a) (This may be an error, the Franklin report was reference (f)) for the U.S.S. FRANKLIN (CV13). The description of the performance of the various piping systems given in the FRANKLIN report applies to the TICONDEROGA as well. (a) The drainage provided for the elevator wells has proven inadequate. Each well is fitted with two 3" I.P.S. deck drains. These drains invariably clog up at the strainer necessitating the removal of the water with portable equipment. The Yard has fitted two 8" I.P.S. gravity drains for each well with a box strainer 21/2 ft. long by 1 ft. high by 1 ft. wide at the inlet to each drain. It may also be noted that similar difficulty has beenn experienced on the U.S.S. SARATOGA (CV3). Personnel of the SARATOGA have suggested the use of a strainer consisting of a vertical run of oversize pipe fitted over the drain opening in the deck, the sides of this pipe to be slotted to provide the necessary strainer area. The advantage of this arrangement lies in the ease of locating and cleaning the drain inlet when the wells are flooded. It is noted that requirments for improvements of elevator well drainage have since been specified by the Bureau in reference (b). (b) It is noted that the ready service lockers serving 5" 38 AA guns Nos. 6 and 8 are not now equipped with sprinkling. Since these are large lockers and are endangered by crash landings and possible gasoline fires, it is believed that a sprinkler system should be provided for these lockers on all vessels of the CV9 Class. (c) Personnel of the ship report that the present arrangement of flight deck drains comprises a serious hazard. When gasoline or oil is spilled on the deck the deck drains release the liquid just under the Gallery Deck level where it is carried by the wind over a large area, especially when planes are being warmed up near the deck edge. While the practice of combining and extending these drains to the waterline involves the hazard presented by piping filled with gasoline vapors, it is, perhaps a lesser danger than the widespread scattering of oil and gasoline which now occurs. (b) Radar Equipment Mk. 12 and 22 (on fwd. Gun Director Mk. 37 ) - This equipment suffered severe shock and fragment damage and is of salvage value only. (c) Radar equipment Mk. 12 (on After Gun Director Mk. 37) - The antenna gear box and the antenna reflector were pierced by fragments. Both units can be repaired. Cables were severed and required replacement. (d) Gun Director Mk. 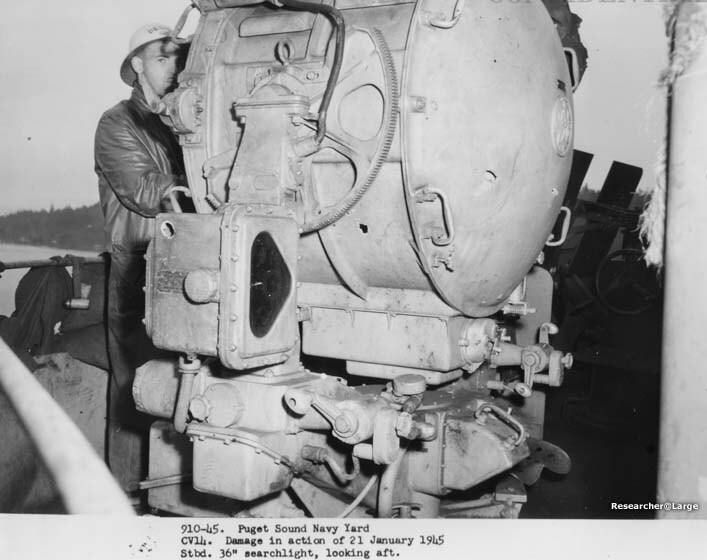 37 (Aft) - The rangefinder was damaged by fragments but can be repaired. 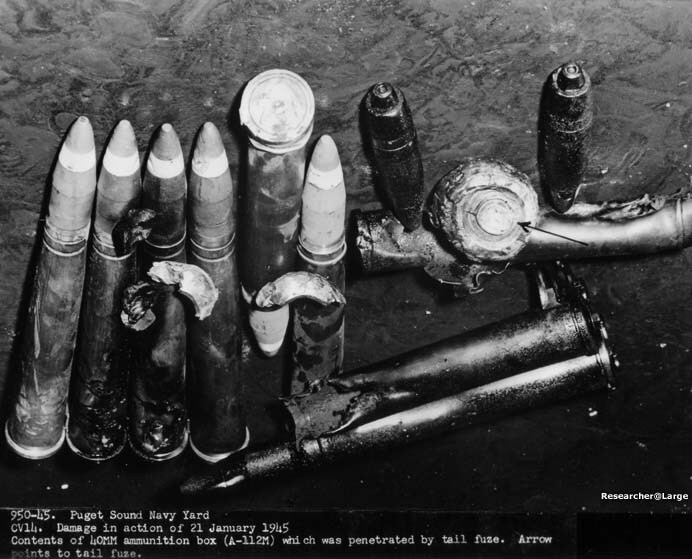 (e) 20 mm gun mounts - Several 20 mm gun mounts were damaged by fragments. (f) 36" Searchlights (Port & Stbd.) - Both searchligbts were put out of action by fragment damage. 2. No change of design would have minimized the damage to ordnance equipment. (a) SK Antenna was badly riddled by fragments and required replacement. (b) SK 1 5/8(This fraction was unclear on the report but I *THINK* it was 5/8. You can make up your own mind here.) inch coaxial transmission line was cut and damaged in numerous places, requiring replacement of the entire line. (c) SC-3 radar was badly riddled with fragments and required replacement. However, this equipment was replaced with new type Radar during the availability period. (d) The SC-3 15/8(This fraction was also unclear on the report but looks the same as the above fraction.) Inch coaxial transmission line was cut and damaged by fragments in numerous places. (e) SM antenna was damaged by fragments and was replaced with a new SP type antenna. (f) SM waveguide transmission line (11/2 x 3 inch) was cut and bent in numerous places, requiring installation of a new line. (g) SM echo box was bent and punctured by fragments and required replacement. (h) SG-1 antenna was pierced in one place by fragments but could be repaired. (i) SG-1 waveguide (11/2 x 3 inch) was bent and pierced by fragments. Temporary repairs were made to permit operation of all equipment. (j) VD-2 remote PPI was destroyed by fragments. (k) BK antennas were destroyed by fragments. (l) Antenna control and coaxial cables for the following radars were damaged by fire and fragments and were replaced: SK, SG-1, SM, SC-3 (replaced with new type radar) BL, BM, BO, BK, BN, YJ-1, and OAA-2. (a) Radio II - One model TDE and one TBM-7 transmitters and motorgenerators were damaged but were repairable. About 200 feet of feeder power cable between 440 v. control board and the transmitter motorgenerators was damaged. TAQ-9, TAJ-10, TBM-7, and TBK-13 transmitters were affected by shock. 2. 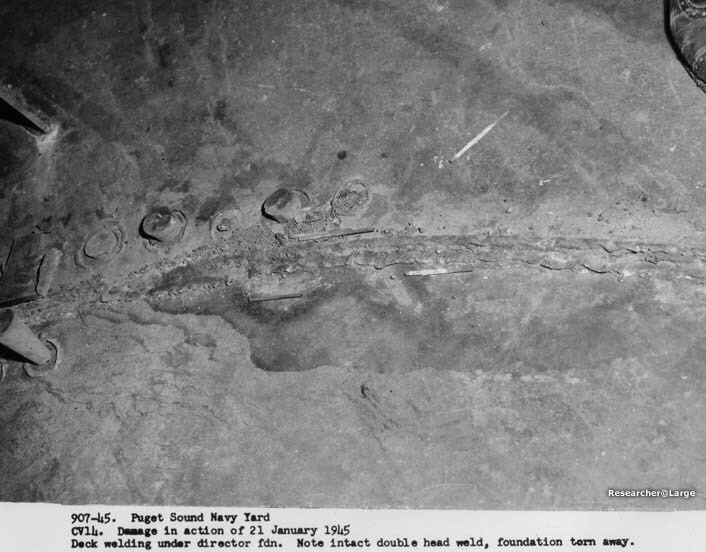 (b) Radio III - Model TBM-7 and TAJ-10 transmitting antenna severed and burned (300 feet). 100 feet of single wire receiving antenna burned. (c) Radio VI - Whip antenna damaged and insulators cracked by shock. (3) Six single wire antennas from Radio I. (4) Two single wire antennas from Pilot House. (5) Two single wire antennas from Aero. Office. (6) Two single wire antennas from Air Plot. (7) Three single wire antennas from CIC. (8) Two single wire antennas from Flag Plot. (9) Three whip antenna sockets in Sky One and searchlight platform. This includes a total of about 1500 feet of single wire antenna and 500 feet of transmission lines. (e) The following is a list of approximate lengths of cables damaged by fire and fragments. (1) Radio I to III - 3000 feet of cable and 1000 feet of coaxial cable (1/4 inch gas filled). (2) Radio I to II - 3740 feet cable and 1020 feet of coaxial cable (1/4 inch gas filled). (3) Radio II to III - 4040 feet cable and 2520 feet of coaxial cable (1/4 inch gas filled). (4) Radio I to Sky I - 420 feet of cable. (5) Radio I to VHF Room - 720 feet of cable. (6) Misc. Coaxial Cables - 2300 feet (1/4 inch gas filled) and 600 feet (type RG 18/U). (7) RBO Receivers to Speaker Amplifiers - 2400 feet. (8) TBS Control Cable - 600 feet. (9) Misc. Control Cables - 450 feet. 1. 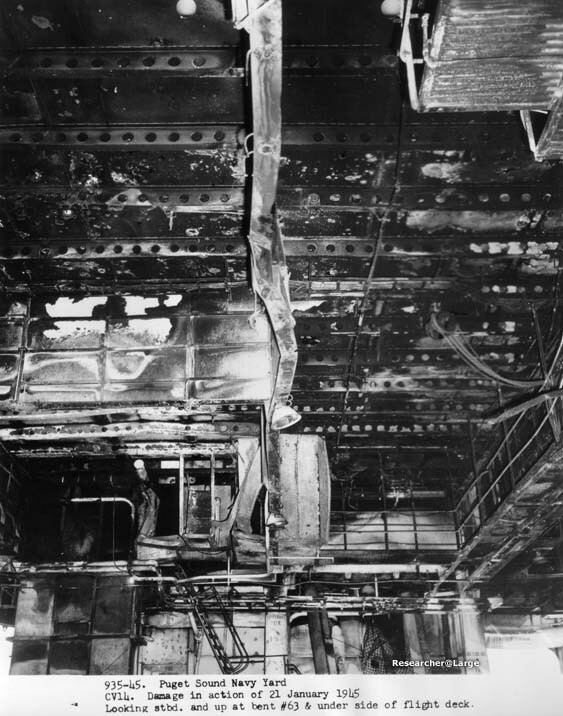 The major portion of the damage to electrical equipment below the Flight Deck was due to fire, explosions of gasoline from airplanes in the hangar space, and water from the hangar sprinkling system rather than to fragments from the bomb explosion in the Hangar Space. Local electrical damage in the forward Air Defense Station and Island Structure was caused by the crash hit on the Mk. 37 Director No. 1. The area in which electrical equipment was damaged by water is shown on photo No. 945-45, and damage by fire is shown on the sketch, Appendix C.
2. Damage was severe at the forward Air Defense Station. Electrical equipment at this station was practically demolished by explosion and subsequent fire. 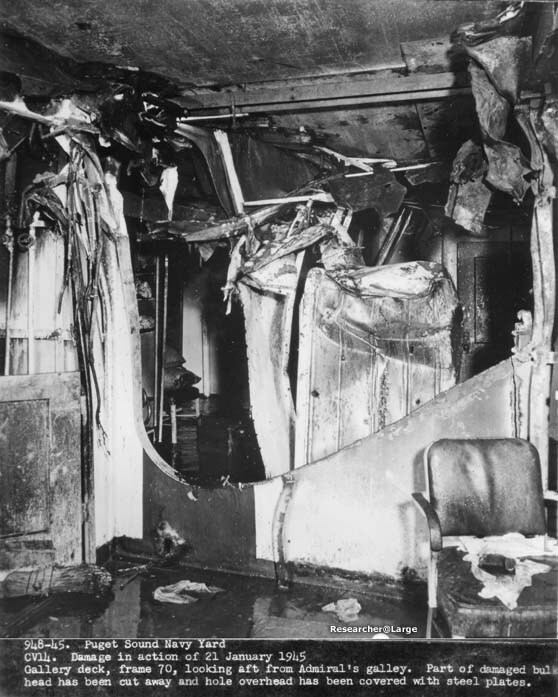 Electrical damage was also severe in the Captain's and Admiral's Country (frames 68-80, Gallery Deck), where all equipment was either destroyed or completely disabled by fire, as shown by Photos. Nos. 915-45, 917-45, 948-45 and 949-45. 3. Destruction of electrical equipment at the forward Air Defense Station resulted in a complete loss of all the vital functions of the station. Damage to the Mk. 37 Director and associated cables at this level caused loss of primary control of the forward 5"/38 twin mounts and auxiliary control of all 5"/38 single and 40 mm quad. mounts forward of the island. Fire damage in the Hangar Space and on the Second Deck caused temporary loss of control for 40 mm quad. mounts Nos. 1, 2 and 4, and put all electrical circuits at 40 mm quad. mounts Nos. 6 and 6A out of commission. Lead sight circuits to 20 mm guns in Battery I and Battery II were lost due to damage in the Hangar Space. The 40 mm ammunition hoist serving ready service room B-0703-M, for 40 mm quad. No. 7 was put out of commission by fire damage to power and control circuits. 4. The functions of launching, handling, and arming of aircraft were impared to a considerable extent by electrical damage throughout the forward section of the vessel. The starboard catapult was rendered inoperative by the flooding of all electrical machinery in compartment A-405-AE. Upper stage bomb elevators B-1-B and B-2-B were inoperative due to fire and flooding of their control circuits. Electric control of airplane elevators 1,2 and 3 were lost immediately after the first hit. However, manual control was still available on all airplane elevators, permitting No. 1 elevator to be raised to the Flight Deck where it was secured. Ship's force later restored electrical control of No. 3 elevator by drying out a control connection box which had been flooded. The night flight lighting system forward of the island was disabled as a result of damage to supply cables in the Hangar Space. The homing lights on the Island Structure were disabled by damage to control leads between Primary Fly and the forward Flight Control Station. 5. Except for damage to some pelorus stands on the Flag Bridge and a gyro repeater at Air Defense Forward, ship's control circuits were not damaged. restored this lighting by rigging 115 volt supply via casualty power equipment to other transformer banks. Fire and fragments caused the loss of all Hangar Space lighting in Bay I and also Bay II to approximately frame 125. All lighting on the Gallery Deck between frames 25 and 80 was similarly affected. Flooding caused the loss of lighting in magazines A-514-M, A-512-M, A-518-M and trunk A-513-T. Type JR hand lanterns installed on this ship operated satisfactorily. 7. Fire and fragment damage caused loss of all voice communication throughout the forward half of the Island Structure, all of the Flight Deck and Hangar Space, and the Gallery Deck forward, with the exception of some sound powered telephone circuits. The sound powered communication unaffected by damage was sufficient to pass all orders necessary for the completion of damage control measures. All damaged circuits were isolated by the ship's force so that other outlying networks of these systems were not affected. 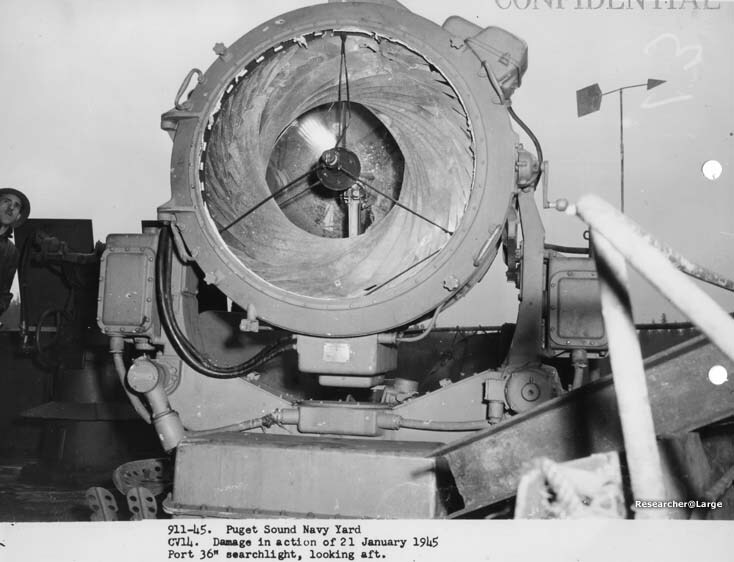 Inter-ship communication by means of visual signaling was impaired to a considerable extent by the destruction of the 24 inch searchlights and by severe damage to three 12 inch searchlights. Both 36 inch searchlights were also disabled by fragments, as is shown in Photos Nos. 910-45 and 911-45. 8. Casualty power generators No. 1 and 2 on the Hangar Deck became inoperable due to fire damage and salt water spray from the hangar sprinkler system. Numerous casualty power risers and bulkhead terminals throughout the damaged areas were grounded by salt water from fire hoses or sprinklers. 9. 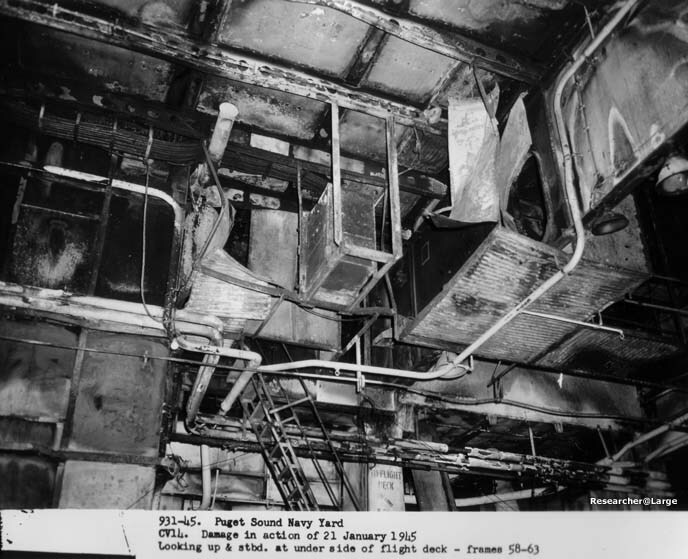 Fire and water damage to the electrical equipment for ventilation systems caused the temporary loss of the major portion of ventilation forward of frame 125 on all decks above the Fourth Deck, including the Island Structure. The ship's force later restored electrical service to a sufficeient number of vent sets to provide necessary ventilation. It was found that the most frequent cause of lose of ventilation was due to fire hose water spray which entered the drip proof case of the motor controllers. 10. Exclusive of demolished equipment within the blast area, investigation revealed that electrical equipment withstood shock satisfactorily. 11. Considerable fire damage occured to cables in wireways on the overhead of the Hangar Space and necessitated the replacement of all cables in the wireways forward of frame 100. Typical examples of the exposed wireways in the Hangar Space are shown in Photos	Nos. 931-45, 936-45 and 937-45. A number of important cables on the Island Structure in weather location are exposed to strafing attacks and bomb fragments. Several cables were cut by fragments, as shown in Photos Nos. 919-45, 920-45 and 928-45. 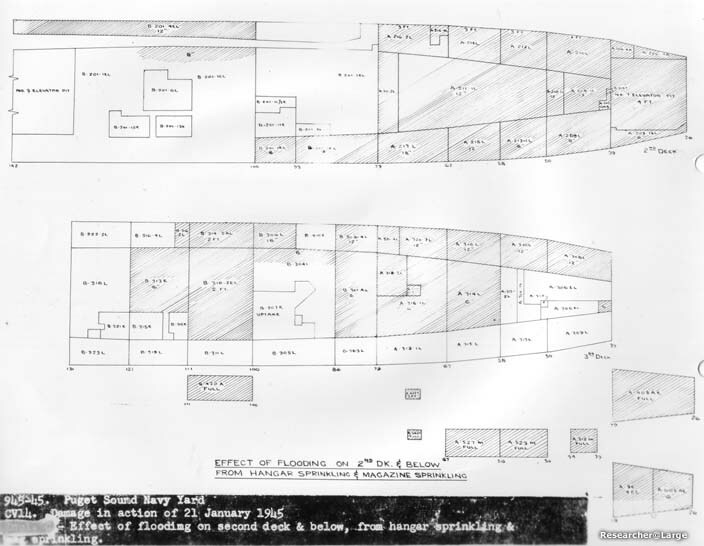 Flooding in Second and Third Deck living spaces from hangar sprinklers caused ground faults or high resistance short circuits, resulting in heavy overloads on three transformer banks, located at frame 73 starboard Second Deck, frame 78 starboard Third Deck and frame 107 starboard Second Deck. The majority of the transformers on the Second and Third Decks were mounted on foundations not more than 5 inches above the deck. Since water was sloshed around with the changing list of the vessel, the transformers were thoroughly soaked. Although shipalts have now been issued to install coamings around flush deck hatches on the Hangar Deck to prevent excessive flooding of lower decks, it is believed that all transformer banks in spaces that may be subjected to partial flooding should be so mounted as to provide maximum obtainable clearance above the deck. (b) Fault current, resulting from the flooding of the transformer bank at frame 78, starboard, Third Deck, was not of sufficient intensity to trip the 65 ampere element "AQB" breaker in panel 3-77-1, but did cause the 400 ampere "ACB" breaker on Generator and Distribution switchboard No. 1 to open. Fault current within the transformer bank at frame 107 Starboard, Third Deck was not of sufficient intensity to trip either the 50 ampere element "AQB" breaker on Lighting and Power Distribution panel No. 3 or the 300 ampere "ACB" breaker on Generator and Distribution switchboard No. 3. However, this sustained fault current was considerably in excess of the "ACB" breaker 100 ampere frame size rating, thus causing the terminal studs to be partially melted and the contact tips to be fused together. In addition, the case of the breaker and the connected cables showed evidence of the intense heat generated by the heavy overload current. All of these "AQB" breakers mentioned are "Grade B" (G.E. type AF-IN), which do not have long time delay overcurrent tripping features. Therefore, for transformers it is recommended that for transformers or other devices not already provided with overload protection, all "Grade B" breakers serving such equipment be replaced with new "AQB" type breakers having long time delay overcurrent tripping features which will act on sustained overloads in sufficient time to protect the equipment and cable network from overheating damage. (c) The three 60 KW, drip proof, casualty power diesel generators located in the Hangar Space at frames 65, 103 and 180 are installed on the deck and, as noted in paragraph 8 above, are subject to salt water spray when the hangar sprinkling system is in operation and to immersion in water accumulated on the deck. The generators are also subject to damage by fires within the Hangar Space. It is considered that the location of these machines without suitable protection from the hangar protection system or fire within the Hangar Space is highly undesirable. In this connection attention is invited to reference (e), in which the Yard recommended locating the machines in bays isolated from the hangar with large sliding doors or curtains on the weather side. This condition was also discussed in the case of CV13 in reference (f). In view of the inherent fire hazard within the Hangar Space and resultand damage to cables, as mentioned in paragraph 11 above, it is believed that only those cables serving equipment within the Hangar Space should be routed through the Hangar. (e) Damage to cables in exposed locations on the Island Structure, as mentioned in paragraph 11 above, would have been minimized if all runs of cable between the forward and after island station had been routed through an S.T.S. trunk, or at least within the island structure. (f) In view of the fact that water spray, which entered approximately eleven vent set controllers, was a major factor in loss of ventilation, it is recommended that watertight cases be used for all magnetic type controllers in ventilation systems. (g) As previously noted in damage reports on other vessels, it was again found that the efficiency of the casualty power system was impaired due to grounding of riser and bulkhead terminals by water from sprinklers and fire hoses. It is considered that the increased reliability gained by the use of standard watertight terminals and risers would justify the increased weight involved. 13. Machinery damage was minor, and consisted of fragment damage to the smoke pipe, whistle, and siren and slight damage to the propellers by debris thrown overboard during the action. 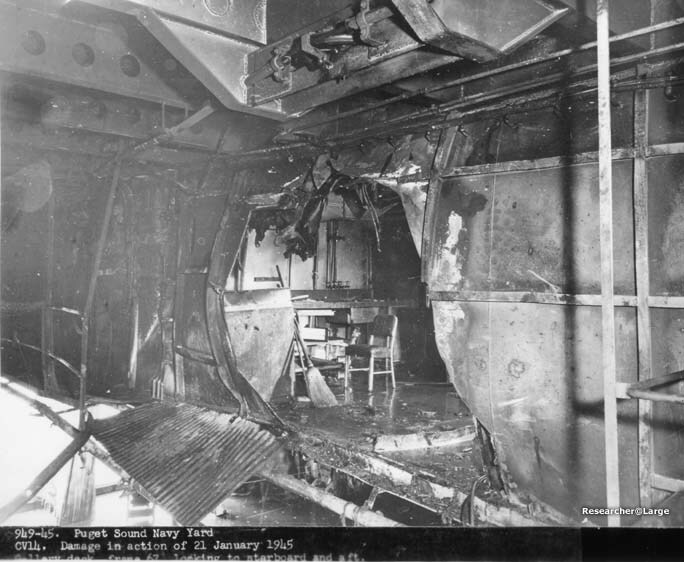 (a) The ventilation ducts from exhaust system 02-68 were demolished where the plane and bomb passed through Passage A-0213-L, the Admiral's Pantry (A-0222L), and the Gallery (A-0218L) on the Gallery Deck level. Vent set 02-68 and the ducts from ventilation system 02-80 in these spaces were damage by fire and water. 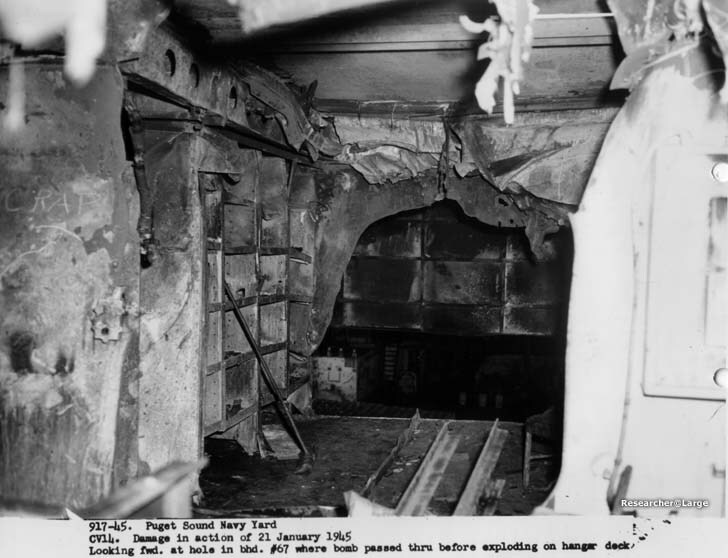 (b) Ducts in the Gallery Deck area, frames 79 to 91, starboard, and in the Island Structure at the Navigation Bridge level, frame 95, were damaged by fragments from the bomb explosion near the 5 inch director at the top of the island, forward. 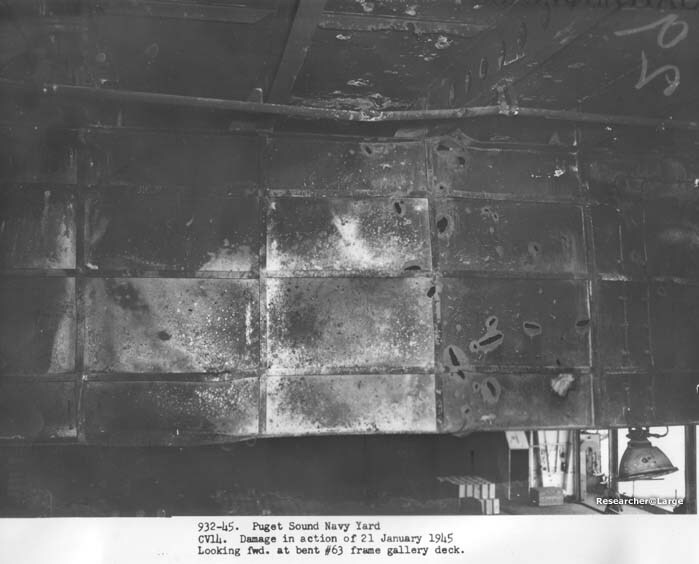 Ducts in the forward part of the Hangar Space just forward of the elevator pit in the Main, Forecastle, and Gallery Deck areas were punctured by bomb fragments or from exploding ammunition in the plane which caught fire on the Forward Elevator. (c) The duct work in the walk way at the Gallery Deck level, frames 77 to 79, port and starboard, was damaged by the fire in the Hangar Space. 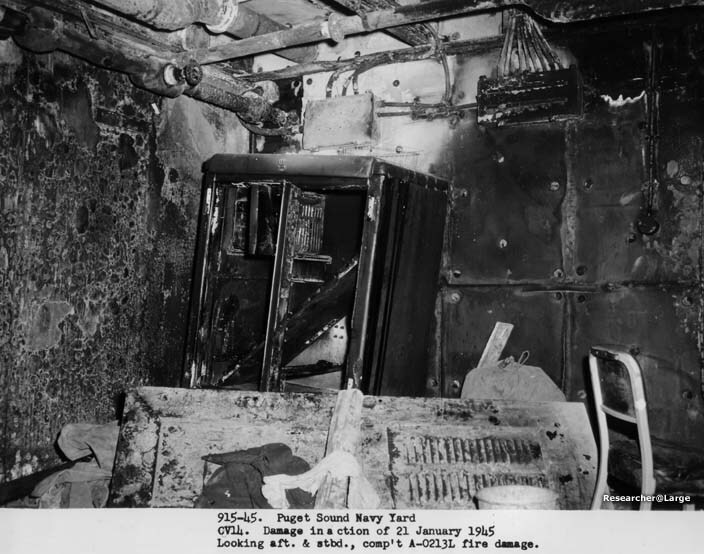 The ducts in the Wardroom Country, Second Deck, port, frames 39 to 50, were burned by the fire in that area. (a) The Catapult Pump Room (A-405AE) was flooded through ventiation exhaust system 2-37 due to the ventilation valve in that space not being closed. This system and exhaust system 2-39 discharge into the elevator pit about 18 inches above the Second Deck. The ducts in these systems are installed below the top of the elevator pit so that water from the hangar sprinkler system which drained into and flooded the forward elevator pit, ran into ventilation system 2-37 and through the ducts into the Catapult Pump Room. The ship was able to close the valves in the other spaces served by the systems, which prevented further flooding. It is recommended that ventilation systems 2-37 and 2-39 be rearranged so that they discharge overboard or discharge above the top of the elevator pit into the Hangar Space. This would preclude entrance of water into the systems when the elevator pit becomes flooded. Additional larger drains were provided for the elevator pits during the ship's overhaul and the ventilation openings were raised to about four feet above the bottom of the elevator pit. Although this arrangement will not prevent flooding in these spaces if the covers are left open and an excessive amount of sprinkling water enters the pit, a maximum of protection is provided without entailing considerable rearrangement of ventilation sets 2-37 and 2-39. (c) The natural supply duct for the Emergency Diesel Pumps, located in the Ice Machine Room (C-614-AE), apparently became clogged, and it became necessary to secure the pumps to prevent the high vacum which would occur in the space from the diesel engine intake air. It is recommended that the intake to the supply trunk be protected from plugging by the installation of a large heavy wire mesh basket (11/2 mesh) around the intake opening. The "F" cover at the bottom of the trunk, cover 6-166-1, and the type "O" covers, Nos. 6-169 and 6-166-3, for the mechanical ventilation in the Ice Machine Room, supply systems 6-169, and the exhaust system 6-166-3 should be removed to comply with the requirements outlines in reference (d). 1. The ship's personnel report that the ship was turned to starboard immediately following the first hit. This action caused a list to port and the ship continued this manuever until the flooding of port side voides B-28V, B-44V, and B-74V produced a permanent list to port. 2. Examination of Photo No. 945-45 indicates that considerably more water was taken aboard by sprinkling than was reported in paragraph 5 of reference (a). However, it should be noted that the depths shown on the diagram are merely estimates of the water in the various compartments at some time during the flooding. No attempt has been made to determine the effect of free surface on stability since the extent of flooding at any instant is not definately known. 3. The recommendations of reference (f) as to disposal of fire fighting water to prevent unnecessary flooding, are applicable to this vessel as well. The following personnel of the Design Section assembled the data and prepared the Damage Report. If you would like to view a link list of all the photos included in this report and their captions you should check out Appendix "A".